Hello there, I've seen on your website that you sell a genuine multipack for HP toner CE25 series (for a HP Colour LaserJet CP3525N). I was wondering if you also sell the same multipack but with a high capacity black toner (CE250X) rather than the standard one (CE250A). I could find the premium value one but not a genuine one? What is a toner collection unit? Please ensure that your printer model is listed at this page before ordering. Will the Colour LaserJet CP3525N print on acetate? What feedback do you have on the compatible HP Colour Laserjet CP3525N cartridges. I have had experience of compatible / recycled cartridges in the past and they have been absolute rubbish. Please let me know what you have been told by your customers? 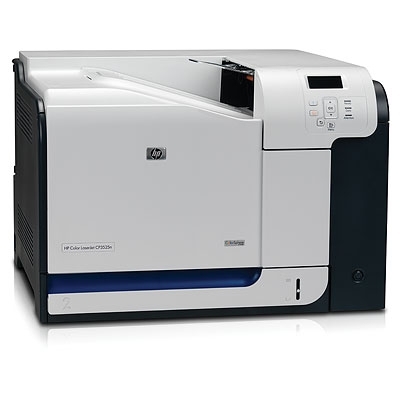 The HP Colour Laserjet CP3525N is a high performance laser printer that delivers both black and colour documents at fast speeds of up to 30ppm. The CP3525N comes with 256MB of internal memory and USB 2.0 connectivity. If you have run out of HP Colour Laserjet CP3525N toner cartridges you will probably be aware that they don't always come cheap. That is until you come to Cartridge Save where we make it more affordable to enjoy HP Colorshpere Toner Technology with our discount range of HP Colour Laserjet CP-3525N toner cartridges. We are an efficient online business and because we operate with low overhead costs we offer a cost-friendly alternative to shopping on the high street. Your laser printer never needs to be out of action either because every single HP Colour Laserjet CP 3525N toner we sell comes with next day delivery. The range of benefits are endless when you shop online at Cartridge Save and our free delivery service is bound to give you a better price on HP 3525N toners than you are likely to find at other online stores. We take customer care to the next level by supporting any purchase of our HP Colour Laserjet CP3525N toner cartridges with our money back guarantee. Forget about poor quality products and enjoy the extra peace of mind you get with our no quibbles return policy which allows you to return any faulty or damaged goods for a full refund. Don't miss out on cheaper HP toners and find yourelf the best deal possible by ordering today from Cartridge Save.